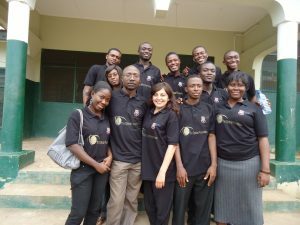 From the July 10th to August 1st of 2011, Esma was sent to Ghana on behalf of The Optical Foundation to continue the Glasshopper project. Esma is a Dutch orthoptist and lecturer at the University of Utrecht. During the period Esma was in Ghana we appointed Dr Godwin Ovenseri-Ogbomo as a project coordinator, to start the necessary preparations on the ground in Ghana. Dr Godwin Ovenseri-Ogbomo is an optometrist and lecturer at the University of Cape Coast. In 2007 and 2008 he helped Carolina to establish The Optical Foundation’s Glasshopper project. Carolina and Godwin published the results of these screenings in a Dutch Optometry Journal. 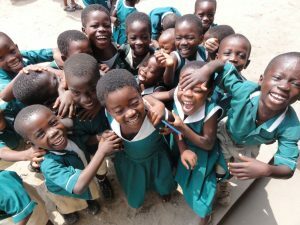 The program during Esma’s stay in Ghana was as follows: Monday to Friday Esma, Godwin and the Ghanaian optometry students (varying anywhere between 6 to 13 students per day) would visit elementary schools and/or an orphanage to perform eye exams on the children. 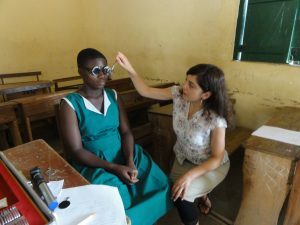 The Ghanaian students obtained practical experience, while at the same time eye test where being performed on children, who if need be would get glasses. The lenses would usually be ordered in Accra and the university technician would mount the lenses into the frames. All this allowing The Optical Foundation to contribute to one of its objective of stimulating the local economy in Ghana. 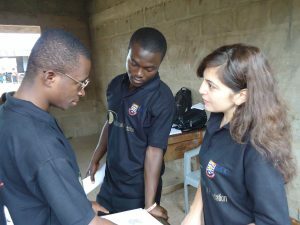 Esma’s stay in Ghana coincided with the holiday period at the University, however all the optometry students voluntarily stayed on campus to help with the Glasshopper project. 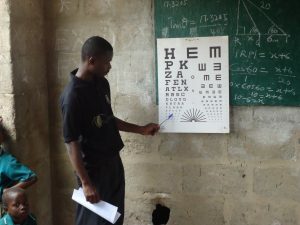 This indicates the enormous enthusiasm of the students in wanting to become specialists in their own country and to contribute to the improvement of eye care in Ghana. After taking part in the 3 weeks of screenings, each student that participated, received a certificate with the number of days they had worked for The Optical Foundation. This is not only a display of our appreciation, but it also reflects well on them providing them with opportunities for their future careers. In addition, it is most likely that two students from this enthusiastic group will become project coordinators of the next The Optical Foundation project.